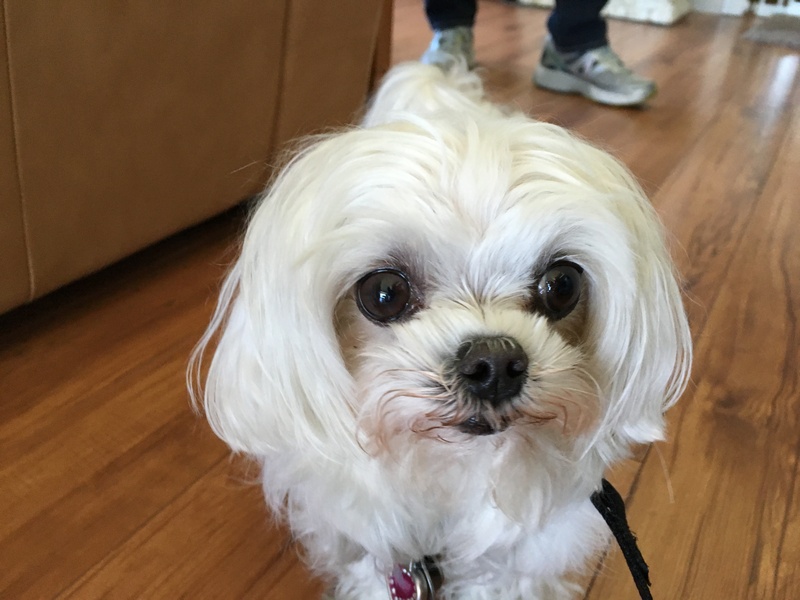 Tashi is a three-year-old Maltese female that lives in beautiful Hermosa Beach, California. I worked with Tasha and her guardian last year on nuisance barking. Due to some changes in her household, Tasha had regressed since our last session. Her guardian asked me to drop by again to help stop her over-barking at guests, inconsistent obedience and continued eating of feces. In my first session with Tashi, we worked on her barking at one of the guardians who was dealing with Alzheimers. Due to its progression, Tashi’s other guardian moved into a facility that could provide him with more supervised care. Most of the behavioral problems that Tashi’s other guardian contacted me for help with seemed to increase once the other guardian left the home. When I arrived for the session I noticed a few things right off the bat. While no one likes to listen to a dog barking incessantly, Tashi’s guardian was not using the best approach to curb the behavior. I think that she had confused some of the techniques that I had introduced to her in earlier session and the combination of the two different techniques was not a good one. I pointed out to the guardian that she was following the dog around while raising her arm up and repeatedly hissing at Tashi. A good rule of thumb with dogs is to never repeat the same command or correction over and over. When you do this, you effectively water down your own authority. The first time that I worked with Tashi I had stopped her barking behavior by simply placing her on a leash and stepping on it about a foot away from where it attached to her collar. For many dogs, blocking their ability to bark then run away is an affective solution. But I wanted to do things a little bit differently during this session to see if Tashi’s behavior has changed. As we discussed what the guardian wanted to accomplish and the changes in the home, Tashi went through waves of barking. They seem to get worse whenever I try to engage with her; specifically when I tried to get her to come to me. Because Tashi was not responding, her guardian started to get frustrated. While that’s certainly easy to do, it’s important that we remember that dogs don’t do things to upset us. Dogs are about as transparent as you can get. In this case, Tashi was barking to communicate to me that she had disagreed with my attempt to control the situation or tell her what to do. This is most likely a result of the fact that her guardian spoils her rotten. Because the dog was accustomed to getting whatever it wanted, on the few occasions she was corrected, she simply didnt understand why the sudden change. As we were discussing this, the guardian continually expressed her frustration saying that she did not understand why the dog was acting this way. I used a number of different analogies and similes to try to illustrate that this behavior was a result of the lack of structure and the catering and pampering that she had done to Tashi in the past. Each time that I suggested a rule or way of introducing structure, the guardian gravitated to how it was detrimental to the dog. When I suggested the Tashi needed to sit and wait for the humans to finish eating food before the dog was allowed to start, Tashi’s guardian said “The poor dog is sitting over there starving waiting for me to finish eating my food.” But waiting an additional five or 10 minutes is hardly something that is going to cause a dog to suddenly be starving. Its important we don’t project our human emotions on our dogs and it was clearly the case here. This was a key component of Tashi’s unwanted behaviors. Dogs naturally want to identify a clear social hierarchy wherever they live. Because Tashi’s guardian had continued to spoil her and cater to her, any time that a human did not comply or disagreed with her, Tashi had a meltdown just like a spoiled child does with a temper tantrum. The only way that Tashi’s guardian is going to be able to stop these unwanted behaviors is to assume the leadership role in the dogs eyes. This isn’t something you can just say, dogs perceive leadership through our actions and how we treat them. The guardian was clearly aware of this as she repeatedly commented on how many of today’s youth have a sense of entitlement. Ironically however, she struggled to make the same connection with how she interacted with her dog. The source of Tashi’s unruly behavior was the spoiling and lack of structure from her guardian. After I finish suggesting some simple rules for her to incorporate, we went through a basic recall exercise. However because Tashi was not on the leash and looked at me as an unwanted guest, her responsiveness was poor at best. Her guardian was quite upset because from her perspective this was a new behavior. She said repeatedly that Tashi would only come to her with treats, but now that I was offering treats she was not responding as she used to. But if the dog only listens under certain circumstances (with treats), then it knows what to do and doesn’t feel it needs to comply unless it wants to. I made a small adjustment to the exercise by placing Tashi on the leash and we got an immediate change in her responsiveness. I suggested that the guardian practice calling the dog over whenever she was across the room or down the hall. When we ask a dog to comply during a simple routine activity like this, it can seem rather mundane. But just like any other type of repetition, practice makes perfect. One of the biggest behavior problems that Tashi’s guardian wanted to work on, aside from eating her poop, was her reaction when people arrived at the door. Tashi barked and did not listen to her guardian as she chased her around trying to correct her. But for many dogs, being chased is a desirable activity. It is validating because the dog is the focus on the guardian’s attention. Dogs seek out our attention and don’t see much of a difference between good and bad attention. So running after and chastising Tashi for barking was almost exactly what the dog wanted. I suggested that the guardian place the dog on a leash whenever she expected company. I also suggested that she periodically place the dog on a leash when she did not expect company just to prevent the dog from creating an association with the leash and arrivals at the door. When Tashi’s guardian pointed out that sometimes guests arrive without her being prepared, I had her step outside so that I could record myself claiming the area around the door. Normally I would have someone go outside and play the part of a guest so that I could walk the guardian through the technique individually while we were both inside. But because Tashi’s guardian did not have any one available to help, I set my phone on a tripod and narrated the exercise by myself. Because Tashi’s confidence level was so low without her guardian being present, she did not even attempt to approach the door. It’s going to be important for Tashi’s guardian to repeat this process 10-20 times in order to communicate that she does not need the dog to assist her with door security. To this end, I suggested that the guardian enlist the help of family and friends to practice the door answering ritual. This way there is no pressure of what the guest must be thinking. And the more the dog practices a behavior, the more apt they are to repeat it. One of the most primally important activities dogs participate in is eating. I spent the last part of the session going over how Tashi’s guardian can incorporate structure to mealtime to help the dog dentify as being in a follower position. Tashi’s guardian is blessed with the gift of being able to do multiple things at the same time. While this skill has serve her well in her human life, it is detrimental to her interaction with her dog. Instead of focusing on one or a few activities and really mastering them, Tashi’s guardian repeatedly jumped from one subject or problem to another which can lead to frustration for everyone. A much better strategy is to focus on a few techniques or commands and master them completely before moving on. I strongly suggested that the guardian focus on the handful of the things that we went over in the session until she has them down pat. Petting the dog with a purpose, not allowing it to eat food before the humans and practicing the door answering ritual will go a long ways towards Tashi learning to respect her guardian as the authority figure. Once that is the case, most of Tashi’s remaining behavior issues will stop or be easy to correct.